Walk through any grocery store and eventually you’ll find yourself in the “specialty drinks” aisle. Among the malt sodas and cans of coconut water you’ll most certainly find the non-alcoholic section and chances are good that it will have been picked clean. Non-alcoholic beer, it turns out, are vastly popular. And why wouldn’t they be? While originally kicking off in popularity during Prohibition, non-alcoholic beer (0.5% ABV or under) has a lot of fans, from pregnant women and people with medical situations that prohibit alcohol to folks who don’t partake for religious reasons. And while many may scoff at even considering the non-alcoholic option, it needs to be said that our society’s drinking culture is so prominent that many feel alienated for simply not being able to drink and they want to join in on the fun with their friends without crossing the line. Unfortunately, most of the mainstream options out there are pretty terrible, brewed mostly by the big brewers and often resembling something along the lines of carbonated water. With that kind of quality, it’s no wonder that non-alcoholic beer gets a bad rap. Thankfully, it’s not all bad. While less readily available in stores, many renowned German breweries, such as Erdinger, Weihenstephaner and Krombacher, have put their centuries of brewing experience to good use by making some fantastic non-alcoholic versions of their beers. The most commonly found are Krombacher Pils, featuring a beautiful grain aroma and a nice dry finish, and Erdinger Alkoholfrei, which is on par with their exceptional wheat beers. Both are personal favourites of mine and do a fantastic job of being both refreshing and destroying any misconceptions about NA beer. For the more hard to find options there is a Canadian site, PremiumNearBeer.com, which has offered a wide selection of non-alcoholic beer and wine since 2013. The site’s founder, Ted Fleming, a beer lover who suddenly became unable to drink after a diagnosis of Crohn’s disease, has made it his mission to remove the stigma surrounding non-alcoholic beverages and proudly sets out to help customers up their game as non-drinkers or attentive hosts. It should be said however that Fleming does more than just sell other people’s non-alcoholic brands — he actually has his own. 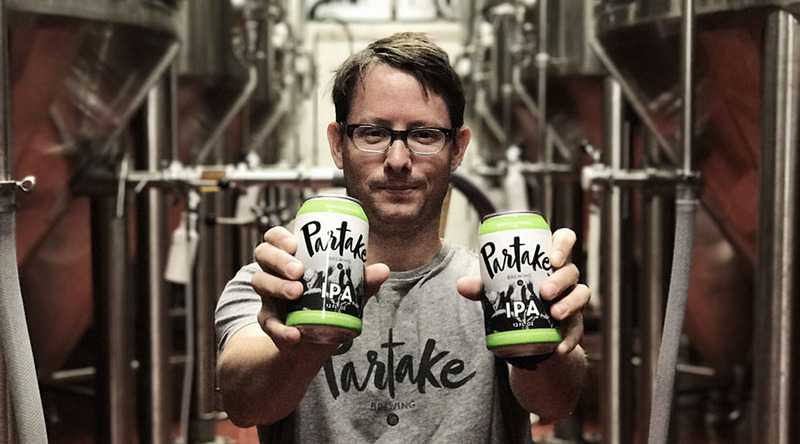 Partake Brewing went through an extensive development phase, even appearing on the hit show Dragon’s Den, scoring a $300K deal with Manjit Minhas, whose experience as co-founder of Minhas Breweries & Distillery in Calgary helped make the dream into a reality. Currently the two beers available from Partake are the IPA and Pale Ale, both at 0.3% ABV and using a low-alcohol brewing process instead of an extraction-style one. Perhaps the best thing about these two beers is the hop character. In fact, I daresay they make the best use of quality hops I’ve seen in a non-alcoholic beer, coming through marvellously in the aroma and taste. So if you’re looking for quality beers during a dry month, you’re covered.